This is a reprint of Richard van Emden’s first book from 1996. The main text has not been amended but there is a new introduction and some more pictures included. Ben Clouting joined the 4th Dragoons in 1913, aged just 15. 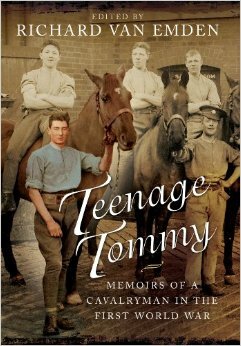 His detailed recollections paint a vivid picture of the training regime and life in barracks before the war. Still only 16 when war broke out, he had to fight to be sent overseas with his comrades, as his true age was known by his officers. However, he succeeded and arrived in France mid-August. He was then thrown into the opening stages of the war, and was witness to the first shot on the western front at Casteau on 22nd August. On 24th August his unit provided cover to the infantry retreating from Mons, and were part of the now infamous cavalry charge at Audregnies. Subject to intense machine gun and shellfire, the charge was broken. The British withdrew, with many of the wounded cavalrymen taken prisoner. In an interesting turn of events, Clouting was then sent behind enemy lines with an intelligence officer, scouting for German positions and movement. They had a number of close shaves including having to hide in a barn for three days with the Germans passing by just yards away. Clouting’s luck came to an end when he was wounded by shrapnel and gas on the Menin road at the Battle of Bellewaarde Ridge on 24th May 1915. After time spent convalescing in hospital, in 1916 he became the ‘horse orderly’ to Adrian Carton de Wiart. Clouting was amongst the first troops who crossed into Germany on 1st December 1918, but his war ended with a bout of appendicitis. The vast majority of the book has been put together from transcripts of interviews with Clouting, allowing him to tell his story in his own words. Van Emden’s narrative is effective and is used to set the context of the key events that Clouting took part in and witnessed. In some places he draws on other sources and notes to corroborate some of the stories, particularly where other versions of events have been recorded. The book is illustrated with several useful maps as well as photographs of Clouting during the war, and pictures of the locations where many of the events recounted took place. Van Emden expresses his regret that he did not ask Ben Clouting certain questions. However we are fortunate that he was able to elicit the level of detail that he did, and we have one more veteran’s recollections because of it.